Fat, Fat Jehoshaphat : Kathie Hill Music, LLC, Making music with and for kids for over 25 years! 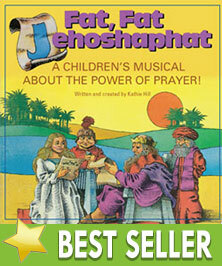 Based on the story of Jehoshaphat’s prayerful and “praiseful” response to attacking armies, Fat, Fat Jehoshaphat teaches kids the importance of prayer when faced with any problem. 2 Chronicles 19 & 20 introduces this good king who turned his people back to the Lord, then kept them in the faith when disaster loomed. Through prayer and fasting, Jehoshaphat was led to send his choir into battle ahead of his army, then all returned to the temple to praise God for their stunning victory. Whatever problems your children face, this musical trains them to respond with prayer and praise! Message: Problems aren’t problems when you pray! I saw this as a production and it was AWESOME! The music is upbeat and sends a POWERFUL message about PRAYER. I bought several CDs so I would have them for my grandchildren..that will be PRICELESS!! Kathie’s Note: I love this musical and its songs are some of the best I've been a part of creating. We staged it in 1985 and again in 1990 when US troops went to the Middle East. Even then our directors explained that Jehoshaphat's weight was a respected symbol of wealth and he led his people in fasting to show they were serious to know God’s will. To ensure this message is clear in today’s weight conscious society, I've included Opt. Dialogue which can be used before "Flat, Flat Jehoshaphat" (Singer's Book pg .15 / Director's Book pg. 25) to emphasize this point. Downloadable book of all songs, script, production notes & piano transcriptions with permission to make 3 copies. Additional copies require purchase of additional 3x license/s. Physical, folo-size book of all songs, script, piano transcriptions, production notes & performance photos . Gently used 32 pg book includes script and all songs in vocal lead line. Limited number. 10 Paper sleeved CDs of complete musical with all songs and dialogue. Downloadable book with script, all songs in leadline with permission to make 3 copies. Additional copies require purchase of additional 3x license/s.